“Just as the bride circles around the groom as an expression of yearning and love, so do we circle Jerusalem’s gates as we express our yearning to see it rebuilt, our yearning for the days when we will all be able to go up to the Temple Mount and to the [rebuilt] Temple, and not just walk on the perimeter road that surrounds the walls”, said Nadia Matar. I really thought I was done blogging about Tisha B’Av and the Temple and was planning on continuing to write about how we in the community of faith can love, but Rabbi Stolper’s article was recommended to me by a friend on Facebook (one who I’ve met in real life…thanks, Michele), so I thought I should read it. And I couldn’t stop reading it, and thinking, and then writing. 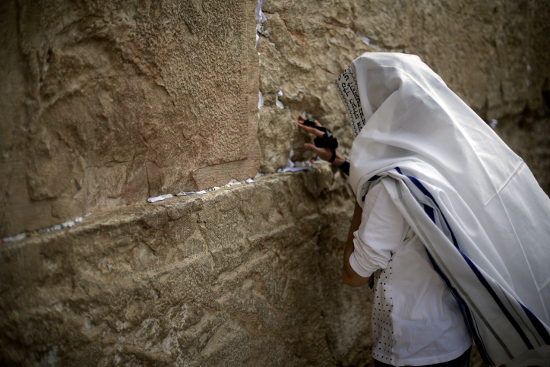 When writing about Tisha B’Av, I naturally tend to focus on grief and loss. It never occurred to me to see the annual event of marching around Jerusalem as an act of love. In retrospect, it should have been obvious to me. Now it always will be. The answer is that Christians will express their love in many and varied forms as God defines love, but not as absolute agreement and approval of all progressive social and political expectations. Palestinians accused U.S. Republican presidential candidate Mitt Romney on Monday of undermining peace prospects by calling Jerusalem “the capital of Israel”, ignoring their own claims to the city and most world opinion. Romney used the term on Sunday to sustained applause from his Israeli audience in the Holy City, during a trip to present himself as Israel’s closest ally ahead of the November 6 election contest with President Barack Obama. “We condemn his statements. Those who speak about the two-state solution should know that there can be no Palestinian state without East Jerusalem,” chief Palestinian negotiator Saeb Erekat told Reuters on Monday. 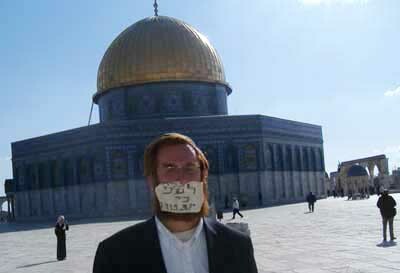 The Jewish people and Israel aren’t the only ones to have an interest in Jerusalem and the Temple Mount. Does loving Jerusalem, desiring that the Temple be rebuilt, and longing for the coming of the Messiah mean that the Jews fail at loving the Arab people? Do they even have an obligation to love and respect them? For that matter, since we Christians have a vested interest in seeing the Temple rebuilt (since prophecy states the Messiah; Jesus will be the one to rebuild the Temple in Jerusalem), do we have an obligation to love the Arab people who oppose this prophecy? Which doesn’t mean we have to agree with their politics or even their religion. Later in his (MK Prof. Aryeh Eldad, co-leader of the Erets Israel Knesset Lobby) speech he referred to the future of the El Aqsa mosque, located on the Temple Mount, as he sees it, and said that we can learn one thing from Beit El’s Ulpana Hill deal, and that is the idea of sawing. “There is one thing we can all learn from one of the most questionable deals we have made lately, and that is what happened at the Ulpana Hill, where they decided to dismantle and relocate the houses, rather than destroy them. At least, when the time comes to reconstruct the Temple, and that time is coming, we will dismantle and relocate the “house” that is currently there. We will cut it up and they can relocate it wherever they want, because that’s where the Third Temple belongs”, called out Eldad over the applause of the crowd. I can’t imagine many Palestinian Arabs “feeling the love” for Prof. Eldad as he compares disassembling and moving the El Aqsa mosque to the way Jewish homes have been taken apart and removed from so-called “occupied” land, and reassembled in those parts of Israel the Palestinians formally recognize as Israel (at least for the time being). I can imagine that they’d experience Prof. Eldad’s words as about as loving as those of Mr. Romney when he declared that all of Jerusalem is the capital of Israel. In other words, Palestinian Arabs would not hear any love at all. It seems as if, at least from a Christian point of view, we have a conflict between our religious and theological priorities and the command to love other human beings. If we, for example, insist that “marriage equality” is in direct opposition to the definition of marriage that Jesus gave us, then we are perceived as not loving gay people. Or if we, using another example, believe that Jesus will return and construct a third, physical temple on the Temple Mount in Holy Jerusalem and re-establish Israel as not only a Jewish nation, but the head of all the nations of the earth, the Arab world will certainly not experience us as loving them, either. So is this an either/or situation? Do we either stick to our theological guns, or toss the Bible, God, and faith out the window in order to blend in and disappear into the progressive social and political masses? Or is it an either/or situation? We are often told by atheists, progressives, and politically liberal religious people that Jesus loved unconditionally. But did he? I have to believe that Jesus loves unconditionally as God the Father loves humanity unconditionally, but that doesn’t mean we are all free to do as we please with no consequences, just because of that love. Apparently, Jesus has standards and expectations. Not everyone will be acceptable to him in the final judgment. There will be distinctions between people depending on how or if they expressed love in terms of feeding and clothing the needy and visiting the hospitalized and imprisoned, to take the examples presented in the verses above. Jesus didn’t say that we had to love other people by agreeing with everyone’s social, political, religious, and national priorities. Loving others, as we see here, doesn’t obligate us to adopt everyone else’s behavioral and social desires, just as God’s unconditional love for us doesn’t absolve us from the consequences of our disobedience to Him. 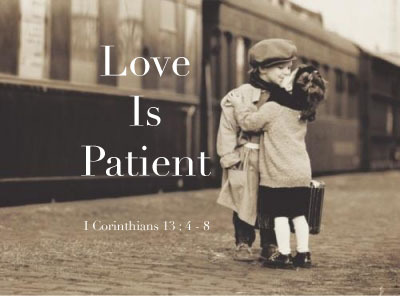 I was recently reminded that the New Testament uses 1 Corinthians 13 as the “crystalization” of Christian love. Love is considered the greatest expression of faith and indeed, is greater than both faith and hope. We must remember that God has been infinitely patient with us. It’s not that he has approved of all of our foolishness, our mistakes, our willful disobedience. But we know that He is slow to anger and abundant in mercy and kindness. If we’ve learned anything at all as disciples of the Master, it’s that we need to be patient, too. We must have patience with our critics and patience with ourselves when we want to respond with anything less than grace. And we must remember that the source of our love doesn’t flow from today’s headline story on MSNBC, or what happens to be trending on twitter or Facebook. The source of our love surges like waves directly from the heart of God. Trust is the child of love, for where love showers down, trust will grow. And since it is a child, the reciprocal is also true: As the child’s call awakens a parent from deep sleep, so trust awakens the love that gave birth to it. Provide love, trust will be born from it. Demonstrate your trust, and it will awaken love. So it is with a child and a parent. So it is with two good friends. So it is with any marriage. Your love may hibernate in deep sleep, but you have trust that the other holds love inside, and in that trust, love awakens once more. So it is with the love affair between your soul and her Beloved above. Trust that He is in love with you, and your love will awaken.